Today seems like a good day for a Shameless (and unpaid) Plug. As we all know I spend a lot of time at the gym, then I usually have to run off to a sporting event or something right after I get done working out. This seems to be year round. Well in the last couple of years I have spent hours with sweat on my face, I would try washing it after working out, using baby wipes to keep my face clean but without any success. I constantly was having a problem with breakouts, especially around my mouth, probably from using my shirt as a sweat rag. Anyway, I finally decided it was time to try something new to clear up the problem. 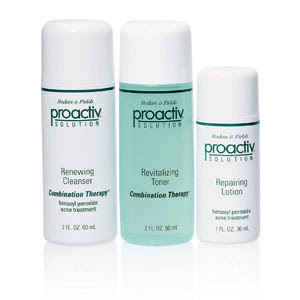 My sisters have been begging me to try Proactiv for a while and I gave in. Let me just say this has been one of the best investments for my face that I have ever made. With in days I was able to see a big difference and now after almost a month I can see such a difference. I still have to spend a lot of time with a sweaty face but this product gets it good and clean first thing in the morning and before bed. I have even noticed red spots (not zits) are less. So for this reason I am officially recommending that you all give this a try if you have the same problem I did. I never had severe acne or anything like that, just constant breakouts around my mouth, but this has been the best help yet. You All Rock My World!!! Relay for Life "The Mystery"